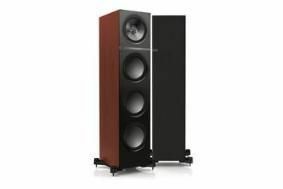 MANCHESTER SHOW 2010: New KEF Q Series floorstanders make world debut | What Hi-Fi? In all there are nine models in the range. The three 2.5 way floorstanders – Q500 (£700), Q700 (£1000) and Q900 (£1200) – use the same UniQ driver technology as the bookshelf Q100 (£380) and Q300 (£450). The KEF Q500 has a 5.25in UniQ driver with a 1in high-frequency unit, plus a 5.25in low-frequency driver and a pair of 5.25in auxiliary bass radiators (ABRs). The Q700 gets a 6.5in UniQ, 6.5in low-frequency driver and two 6.5in ABRs, while the flagship Q900 has an 8in UniQ, 8in LF driver and a pair of 8in ABRs. KEF says the Q500 is designed for music or front speaker duties in smaller home cinema systems, the Q700 for larger rooms and budgets and the Q900 for "the largest of rooms or those customers requiring exceptional bass response". You can hear the KEF Q Series in action in the El Greco Suite at the Manchester Show this weekend.